My dog absolutely loves this toy. He has it in two colors. It's well made and thick. It isn't as annoying as some squeak toys. It's always easy to wash off. While there are no bits of bacon inside, the Globlet pig dog toy is filled with hours of chew-time fun for pets of all ages. 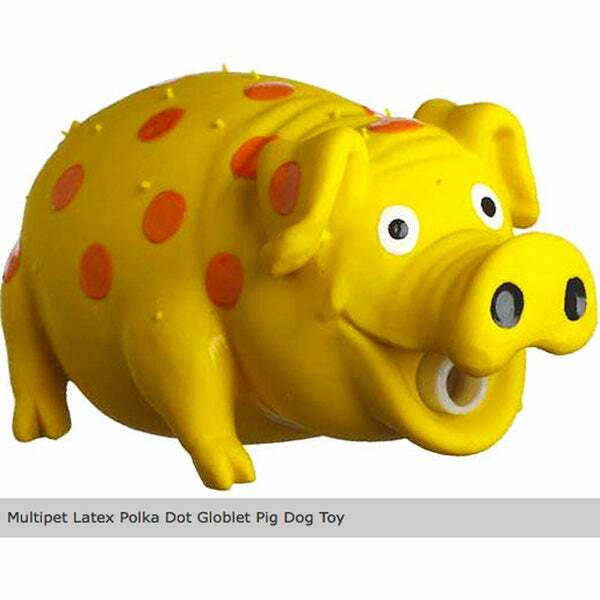 Available in multiple colors, this latex pig grunts when squeezed. This toy, I should have kept for myself. It makes a pig noise when squeezed. I gave this to my Blue Healer pup as I sat down to eat. By the time I was done eating, so was she. She had ripped the nose off and sucked the foam out. She spit that out on the floor and pulled the flex hose out and chewed that in half. This toy didn't last fifteen minutes, but did make noise. My dogs loved this on Christmas morning. The pig sound is a joy to their ears. They just kept biting it just enough to hear the pig squeal. It hasn't broken yet. Thevnosie maker is in the mouth area and they can't get it out. Maybe they know they want this one to last! I've bought a bunch of Overstock toys for my overendulged poodle, this pig is the funniest and, along with the rubber chicken, the most indestructable (so far) Dog's review is that the rubber toys are the best. Fun toy for the dog. He did rip one of the feet off, but the pup hasn't completely destroyed it yet. It scared him at first, and he was trying to be gentle with it. (feels a little like real skin) Other than that a fun toy. Too Funny, nothing like this! My Greyhound has 6 of these and plays with all of them! They don't squeek, they oink! Great toy! This is adorable! Anything that makes noise my dogs love. It will be a hit on Christmas morning! Was supposed to be yellow to match the one he had as a pup. But I wasn't going to take it away and send it back. A favorite of our new pup's toys, he carries it in his mouth where ever he goes!